Beef isn't just for burgers. Add some flair to dinner with this flank steak recipe. Flank steak is one of the more flavorful cuts of beef you can buy, and it's surprisingly inexpensive. Add some zing with grated ginger, spice with green onion, and heat with red pepper flakes. The reduced-sodium soy sauce and sweet chili sauce take this recipe over the edge and make your taste buds sing with praise. Is your mouth watering yet? 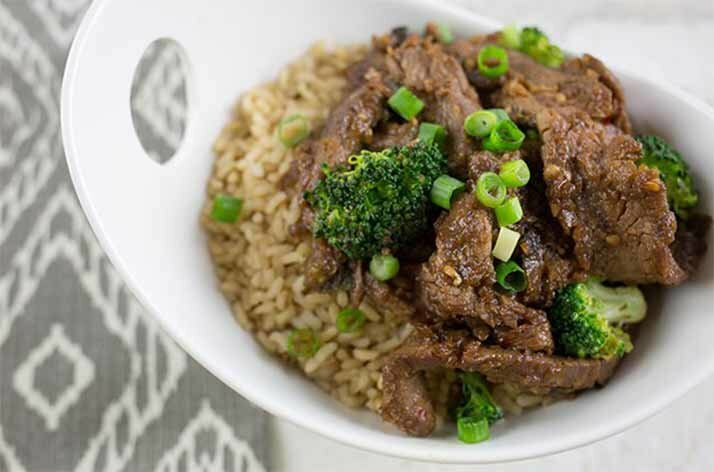 Combined with cooked broccoli and rice, this savory flank steak is perfect for a protein bowl your family's sure to love. So go ahead, shake up your dinner, and take the leap from bland to bold with this recipe. Pro tip: Cut the flank steak against the grain so that you're cutting the protein strands shorter, therefore making them more tender and easy to chew.